It’s been a joyous day here at the farm. 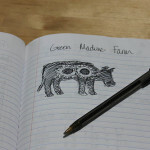 It’s the new year, we’re starting a new farm, farmers markets are taking vendor applications, and we’ve got piles of paperwork that need to be done. First up: Mark all the Farmers Market dates on the big calendar, along with first and last average frost dates, and dates for a few webinars I’d like to attend. Then we get into the fun stuff. Start things off with a bit of light reading, say the Minnesota Department of Employment and Economic Developments delightful little tome “A Guide To Starting a Business in Minnesota.” It’s 358 pages of fun, let me tell ya. Then we have to file with the Minnesota Department of Agriculture (MDA) to get a certificate exempting us from the Corporate Farm Law because we are a family-owned LLC. Next on the list is registering with the MDA as an on-farm exempt producer for poultry and eggs. 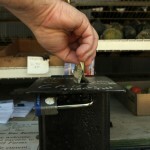 This will allow us to sell our eggs to retail customers, restaurants and grocery stores. As far as poultry, we will be able to process and sell up to 1000 birds per year from our on-farm store without any further paperwork or inspections. If we want to sell a farm-processed bird at the farmers market or sell more than 1000 birds per year anywhere, then we will need to have our facility inspected by the MDA. Our plan is to sell a few birds at farmers markets, so for now those birds will have to go to a USDA or State-inspected facility for processing. 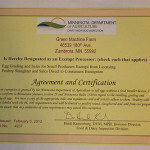 We are exempt from having a Minnesota Retail Food Handlers License because we will only be selling products that came from our farm, of which the meats will be processed in a USDA-inspected facility. Our breads and any canned goods aren’t potentially-hazardous foods and are specifically exempted, so we’re good there. Minnesota puts out a handy PDF called the “Operational Guidelines for Farmers’ Market Vendors” which seems to cover all the legalities of this stuff. Due to the somewhat byzantine nature of Minnesota’s laws, I’m still feel like there’s some license or inspection we will end up needing that will materialize out of nowhere. Time will tell, I suppose. We are also exempt from collecting sales taxes (and getting a tax ID number) because Minnesota does not levy sales tax on Food except candy and soda. As we do not yet have any soda trees or candy bushes, we ought to be OK for a while. With all that out of the way (at least for now), we move on to Vendor Applications for the various farmers markets we might want to attend next year. Red Wing has a nifty single-page application, while Northfield seems to want our entire life history on their 5 page application (not counting the 8 copies of licenses they want you to attach). But at least those two have applications available online. I’m still waiting to get my hands on applications from Rochester and Eagan. I gotta call those guys back tomorrow and harangue them about it a little. The only application deadline that’s coming up fast is for the Red Wing farmers market. I have to make it to Red Wing tomorrow before their annual winter meeting to get in our application. So that’s been my day. Try not to get too jealous of all the fun I’m having. 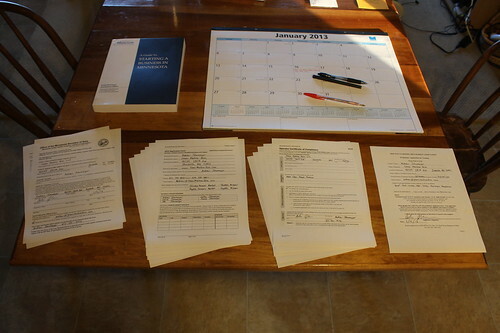 I really appreciate that paperwork season is in winter for the most part. I would hate to be a farmer down under and have to do year-end accounting in the summer. Sounds like you have all paperwork under control Andrew. Way to go! It is fun learning what other states require.